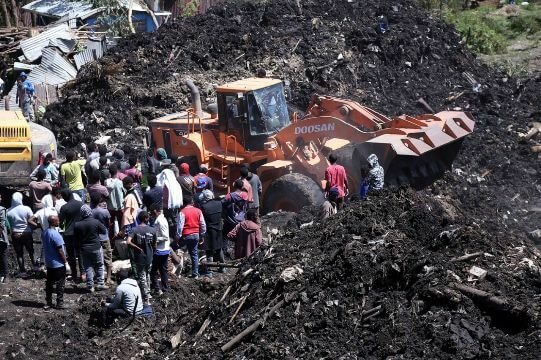 In the most appalling reflection of human misery, a mountain of garbage collapsed this weekend in a gigantic garbage dump outside Addis Ababa, Ethiopia’s capital, crushing some 50 people who lived there or looking for something useful among the waste to sell. The rescue operation continued Monday at the Koshe dump, while family members held up photos of their relatives, waiting for await news about the dozens of missing persons. At the moment it is unknown what caused the collapse occurred Saturday night in Koshe Dump, which buried several makeshift houses and concrete buildings. The site has been the dustbin of the capital for more than 50 years, and every day hundreds of people go there to seek their livelihood or live directly in the place. Dagmawit Moges, spokeswoman for the city of Addis Ababa, reported that most of those killed were women and children, and authorities expected to find more bodies in the coming hours. Relatives wait in these hours in a row in the narrow streets surrounding the dump as police try to prevent people from entering the site. The head of medical services at the Alert hospital, where transferred to the wounded, Solomon Bussa, said they treated about 54 people. Many houses were buried in the garbage. There were about 150 people on the scene when garbage slips occurred, stated the resident Assefa Teklemahimanot to The Associated Press. Many of the people who live in the garbage dump subsist on the search for objects in the trash, but others live there because the rent of houses made with mud and sticks is relatively cheap. An AP reporter saw four bodies that were removed from the site in ambulances after having been removed from the rubble. Elderly women were crying and other people were waiting for anxious news about their loved ones. Six heavy machinery operators dug through the ruins. “My house was right there”, Tebeju Asres pointed to where two machines were digging deep into a black mud. “My mother and three of my sisters were there when the avalanche occurred. Now I do not know the fate of all of them”. The resumption of garbage discharge at the site in recent months probably caused the collapse, Assefa said. In recent years garbage was stopped at the site, but it resumed after that farmers in a nearby region blocked the download to a new garbage dump that had been built in their area.